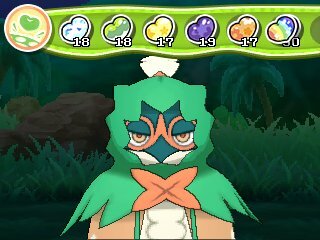 The easiest way to get Poké Beans is in the Poké Pelago, using Isle Abeen. You will get a selection of beans every day, regenerating as time progresses, which can be picked up after falling from the beanstalk. The patterned and rainbow beans are rarer than normal. 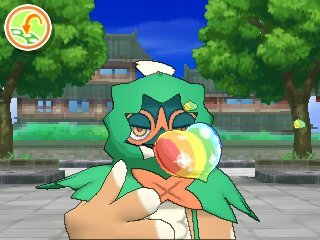 You can also get them in Haunted Houses in the Festival Plaza and as a gift from the cafés in Pokémon Centers. In Pokémon Refresh, the Poké Beans are used as food. Pokémon enjoy eating Poké Beans but will not eat them when their hunger meter is full. Each bean will add to the hunger meter, but will also add to the affection of the Pokémon. Regular beans add a little bit, Patterned Beans add a lot, and Rainbow Beans add a significant amount. Rainbow Beans are very rare and as such have a massive increase on affection. 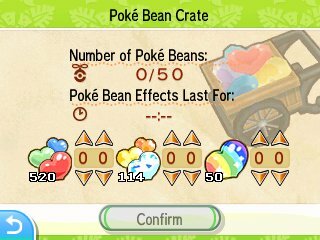 Just one bean will get a Pokémon from 0 Affection to 3 Affection, and two more will max it out meaning you only need 3 Rainbow Beans to fully max out a Pokémon's affection. Poké Pelago gets the most usage out of Poké Beans. In this area, everything is timed and the Poké Beans will affect each island's special feature. You can put 20 Beans in at Level 1, 30 at Level 2 and 50 at Level 3. Isle Aphun - Halves time taken in each activity. 1 minute = 30 seconds. Isle Evelup - Halves time taken in each activity. 1 minute = 30 seconds. Isle Avue - Increases the happiness gained. Each bean has a specific time value that its effect lasts for: Regular Beans last 20 minutes each, Patterned Beans last 1 hour and Rainbow Beans last 2 hours..